WOOD DALE, IL – The innovative Glide Screw from Thomson Industries, Inc. has won the Design News 2013 “Golden Mousetrap” Award in the Automation and Control Motors and Mechanical Motion Devices category. The awards showcase the best new products and celebrate people who are leading and invigorating design, engineering and manufacturing in North America. Announced on February 11th during the Pacific Design Manufacturing Show in Anaheim, California, the Glide Screw was one of three products to be selected for presentation by panelists in the center stage at the show. Robert Lipsett, Site Leader at Thomson BSA presented the product and answered the judges’ questions. The Glide Screw is a considerable success for Thomson and a real benefit to machine designers. 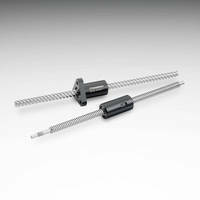 Its breakthrough design combines the function of linear bearing and lead screw into a single device which eliminates the need for any external guide, significantly reducing the overall footprint of the linear motion system. The Glide Screw provides a reliable, pre-aligned solution that needs no ongoing regular maintenance. It simplifies machine design, reduces assembly time and gives a lower total cost of ownership. Thomson Industries, Inc. is a leading manufacturer of linear motion products, providing expert solution and support across many applications. Indeed, the 3D printer used to create the actual Mousetrap awards used Thomson screws within its design – meaning Thomson even helped to create the award as well as win it! With more than 60 years of motion control innovation and quality, Thomson Industries, Inc. is the industry’s premier producer of Linear Ball Bushing® Bearings and Profile Rail Bearings, 60 Case® Shafting, ground and Ball and Lead Screws, Linear Actuators, Gearheads, Clutches, Brakes, Linear Systems, and related accessories. Thomson invented the Linear Ball Bushing Bearing in 1945, and has set the standard ever since with an unsurpassed set of mechanical motion control solutions serving global commercial and aerospace & defense markets. Thomson Industries, Inc. has facilities in North America, Europe and Asia with over 2000 distributor locations around the world.